Selva is the county of water. 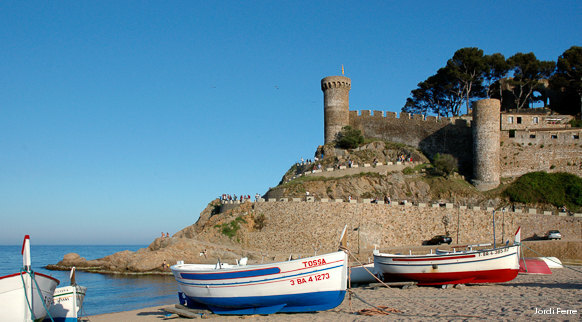 It's got the salt water of the Mediterranean, which you can enjoy on the beaches of Blanes and Lloret de Mar, not to mention in the coves of Tossa de Mar, right next to the castle and the spectacular Vila Vella (old Town), a wonderful mediaeval jewel. It's got plenty of fresh water too; rivers, streams and brooks are scattered throughout the area, bathing inland towns that really should be on your list of places to visit, such as Hostalric or Arbúcies. Selva is the ideal place for indulging in your favourite outdoor activities. And when you want to forget your daily routine and be transported to a world of wellness, you can enjoy the thermal waters in the health resorts of Sant Hilari Sacalm, Caldes de Malavella and Santa Coloma de Farners.